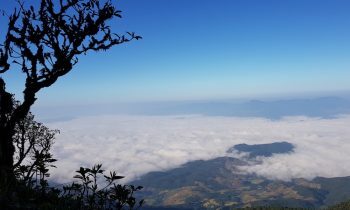 This three day Karen Trekking and Cycling Adventure is a join-in tour with fixed departures on Thursday and Sunday. The group will be maximum 10 persons. Enjoy a leisurely bicycle ride through typical beautiful Lanna countryside along the Ping River, through rice fields and fruit orchards. We will make some interesting stops along the way at the Chiang Mai Doll Museum and Factory. We pedal through a village that specialises in the production of a special kind of paper. We end the ride at a seldom visited ruined city. Then the trekking part will start. We are in the mountains but the trekking is not too hard. 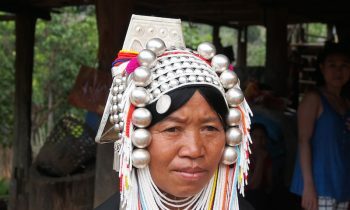 You will enjoy the hospitality of the Karen people. They have their own specific traditions and their own language. You stay in their houses and meet them unclose. It is a wonderful outdoor experience. Your guide will meet you at the hotel. When all travellers have been picked up we head to the starting point of our Bicycle trip. that starts this Karen Trekking and Cycling Adventure. We pedal along the Ping river and then turn off into the countryside with rice fields and fruit orchards. First stop will be the Chiang Mai Doll Museum which houses an amazing collection of dolls from all over the world. It is also a workshop where beautiful dolls are being handmade. We continue to a village that specializes in the production of Saa Paper. It’s a very interesting process. The paper is made of the bark of the mulberry tree. Through beautiful countryside we pedal to Wiang Takan, a ruined city dating back to the 12th century. It is the end of the bicycle ride. Time for lunch. We do that in one of our favorite restaurants. After lunch we drive the short distance to where we start trekking. It’s mostly uphill today to the village where we spend the night. After arrival in the Karen village your guide will introduce you to your host for tonight. You can explore the village on your own or help our guide prepare dinner. After dinner it is time for games and stories. You will spend the night in a village house. Roosters will wake you up. Your guide will prepare breakfast. After breakfast we will walk around the village to get a glimpse of the daily life of Karen people. 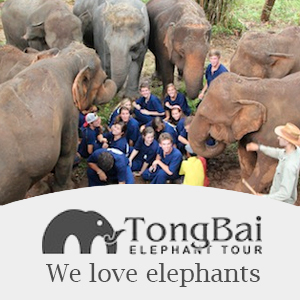 Then we will start trekking into the protected forest of the Mae Wang National Park. In the beginning we will trek along a broad trail until we hit the narrow forest trails. Look out for wild ginger, tree ferns and orchids. Your guide will tell you about the trees and plants around you. There is plenty of time for stops along the way. We will enjoy a “jungle lunch” in the forest. After lunch we will trek further through the forest until we reach another Karen village.This area is really the Karen heartland. Here we will take a break until we descend to the another Karen Village. Here we will spend the night. Your guide will introduce you to your hosts. Enjoy a cup of tea or walk around the village. Your guide will cook for you and can teach you some of his culinary secrets. We will spend another night in a village house. Soon after sunrise the village comes to life. Enjoy a heart breakfast prepared by your guide. Today we will walk downhill most of the time. After breakfast we will start our descent back to civilization. We pass ricefields and trek through beautiful tropical forest before we reach a pretty waterfall where we will spend some time relaxing, swimming and enjoying nature. Shortly after our bathing session we will meet our driver again on the main road. Lunch in a village house follows. After lunch we will drive to a small rafting camp. Board a bamboo raft for a fun trip on the Wang River. It will take about 45 minutes and you really might get wet. After this we board our trekking truck for the drive back to Chiang Mai. Before we drop you off at your hotel or guesthouse we will stop at a local fresh market. Say goodbye to your guide and driver. We hope you enjoyed our Karen Trekking and Cycling Adventure. Fully charged batteries or even an extra battery for your camera. 1000-1500 Thai Baht per person in small (not bigger than 500 Thai Baht and plenty of 100 Thai Baht notes). This is for souvenirs, drinks and tips.